Kashmir is witnessing a growing trend of young boys and girls participating in sports competitions. But quite a few of them eventually get the medals. And aspiring for medal is a gruelling task. But the aspirants who start early have the potential of making to it faster. 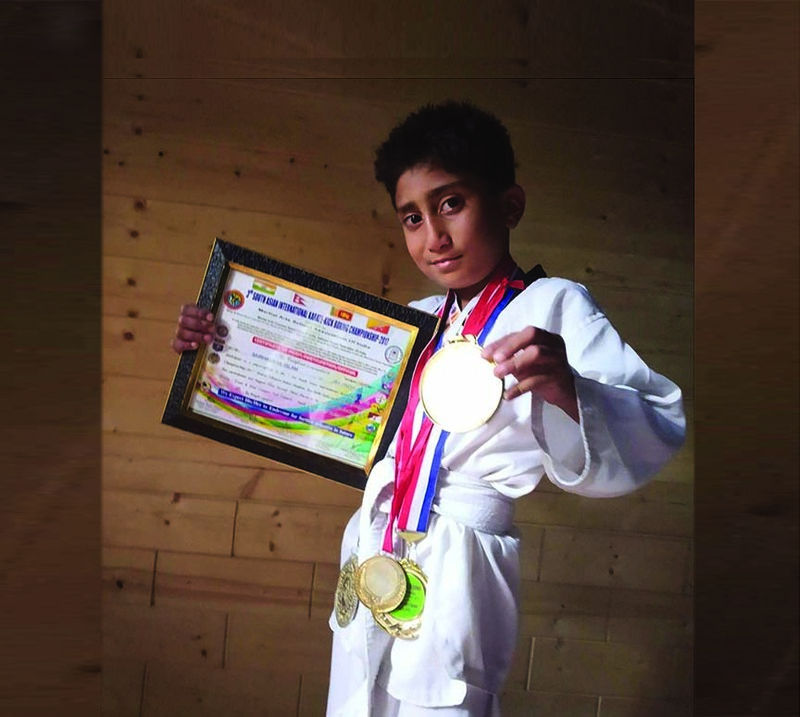 A little boy from Budgam has made it to World Championship in Karate Kickboxing 2018. He has a huge determination at a young age. A third primary student, Sehraan-ul-Islam, 8, is from Chewdoora village near Beerwa. He was barely two years old when his parents sent him to Mahakumb sports festival in Gujarat, to get training in Karate Kickboxing. Holding a bunch of medals and certificates, an enthusiastic Sehraan at his home is ready to fly for the world championship 2018 now. After completing his course from Gujrat, Sehraan, then barely three, played his debut in 2015, a district level match in Budgam and won the gold and the best player award. A student of Alpine Institute of Modern Education in Sonpaha Beerwah, Sehraan later honed his skills from his coach Khalid Chopan at Khalid Sports Academy in Magam, Budgam and is practicing for new matches. In 2016, Sehraan defeated his rivals from other states of India in Jammu and won the Gold and Best player award again. Later, he participated in Taekwondo open National in Srinagar and won a bronze medal from there. In December 19, 2017, Sehraan went to Delhi to participate in third South Asian International Karate Kickboxing Championship 2017. He defeated his three rivals from Sri Lanka, Bhutan and Nepal in three bouts at Talkatora Indoor Stadium. He was honoured with the gold in 21 kilograms weight category. Sehraan has become the first Kashmiri kickboxing player to participate in internationals at a very young age with many gold awards. Appreciating his talent, District Development Commissioner Budgam, Muhammad Harun Malik, felicitated Sehraan for winning a gold medal in ‘3rd South Asian International Karate Kickboxing Championship 2017’ in Delhi against three opponents from three countries. The DDC praised the grit and determination of the boy who has made not only the district but the entire state proud and hoped that his success would inspire other children to emulate the same. Sehraan also received a sports kit as a token of appreciation from the DDC. Despite medals and appreciations, Sehraan had to face hurdles in the initial stage of his career. “When my parents shifted me to Gujarat for the training, I was badly missing them, but as we say time heals everything, I started showing promising growth in learning,” Sehraan said. For a three-and-a-half-year-old kid, staying in a hostel is not really an easy job, but Sehraan stayed for one and a half year without his parents. “My father visited me many times there, and I had also promised myself to get trained properly,” he said. Sehraan usually keeps his focus on one type of workout for himself. But as he says, he loves to be part of the multiple games that include cricket, football and many more. Beyond that, he has a proper nutritionist on call for the dieting plans. “My nutritionist provides me a list of a diet plan based on my work and health conditions,” Sehraan said. Every day, Sehraan practices for almost two hours and vista his coach at Tangmarg. Besides coaching classes, his everyday work is to get engaged in boxing and kicking. Sehraan’s father, Ellahi Faizan, is always keen to see his son participating in kickboxing events happening all over India. “I work just to see my son on the top, and Inshallah as he has been selected for the world kickboxing Championship, I am just waiting for the day when my son will get the first position and make me and the whole Kashmir proud,” Faizan says. Next Article Do we have a civic sense?